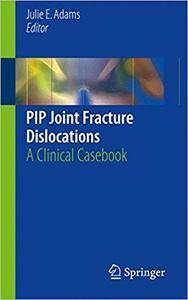 Julie E. Adams, "PIP Joint Fracture Dislocations: A Clinical Casebook"
Comprised exclusively of clinical cases covering injuries to the proximal interphalangeal (PIP) joint, this concise, practical casebook will provide orthopedic surgeons and hand surgeons with the best real-world strategies to properly manage the multifaceted surgical techniques for management of the PIP. Each chapter is a case that opens with a unique clinical presentation, followed by a description of the diagnosis, assessment and management techniques used to treat it, as well as the case outcome and clinical pearls and pitfalls. Cases included illustrate both operative and non-operative treatment of volar fracture dislocations, dorsal block splinting and pinning, ORIF with screw fixation, volar plate and hemi hamate arthroplasty, PIP joint fusion, and pediatric PIP joint injuries, among others. Pragmatic and reader-friendly, PIP Joint Fracture Dislocations: A Clinical Casebook will be an excellent resource for orthopedic surgeons and Hand surgeons confronted with both common and complex fractures to the PIP joint.